Mercedes has revealed the production version of its new X-Class pickup – its first appearance in this segment – following the reveal of X-Class concept late last year. 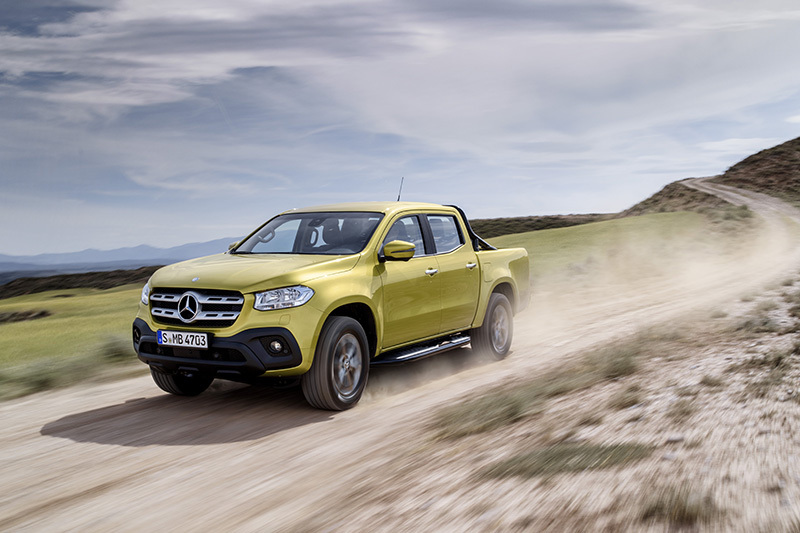 Based on the Nissan Navara and manufactured by Nissan in Barcelona, Spain, the new X-Class will go on sale in European markets this November, with prices in Germany set to start from 37,294 Euros. 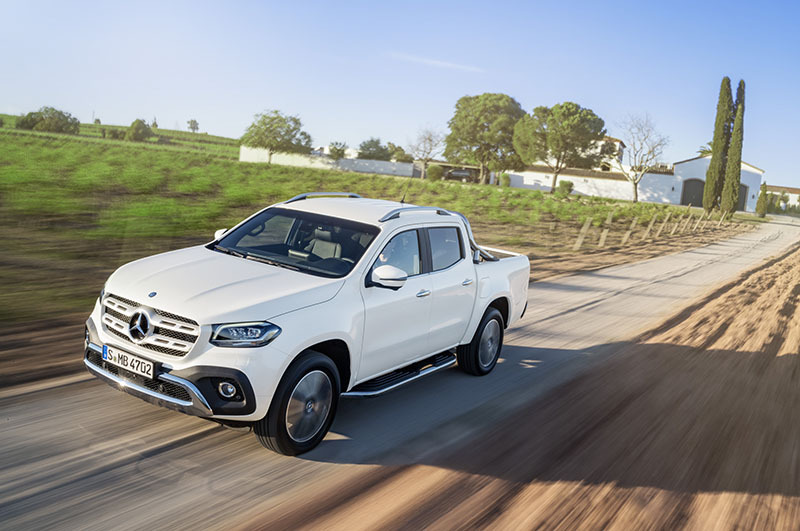 In early 2018, it will launch in South Africa and Australia – arguably the largest global market for pickups (more colloquially known in those markets as utes or bakkies) – with Argentina and Brazil following at the beginning of 2019. Mercedes has taken an unashamedly more luxurious look at the pickup market, targetting – among others – what it calls ‘individualists’ and adventurers. That means instead of the more traditional leaf springs, the rear suspension makes use of a coil sprung multi-link set-up, with a fully independent front end. However, the X-Class can still carry a payload of 1.1 tonnes and tow up to 3.5 tonnes. A 20mm raised suspension set-up can be ordered as an option, increasing ground clearance to 221mm and leading to approach/departure angles of 30.1 and 25.9 degrees respectively. Fording depth is quoted as 600mm, with a 22-degree breakover angle for raised suspension models. 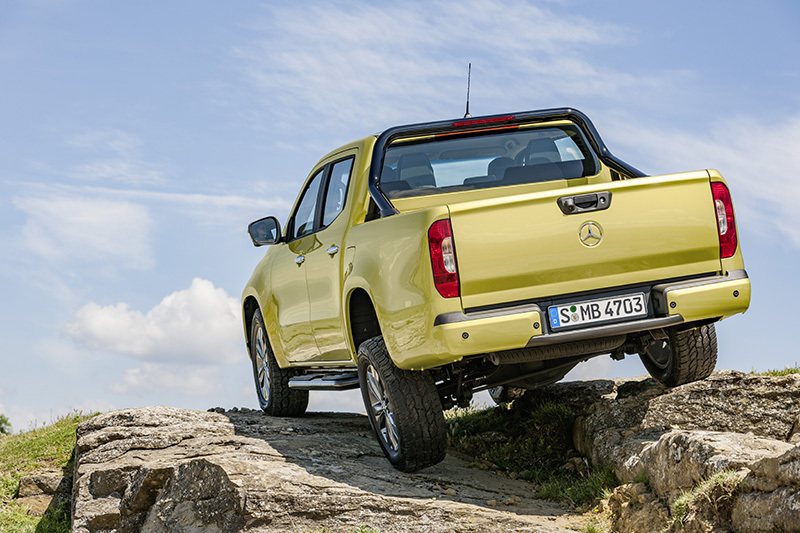 A rear diff lock will be available as an option, while all 4Matic models come with Downhill Speed Regulation. 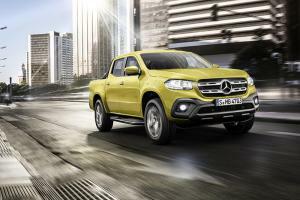 Mercedes’ pickup will be offered in three guises: Pure is the most rugged and functional, while Progressive adds a series of more comfort-oriented features. 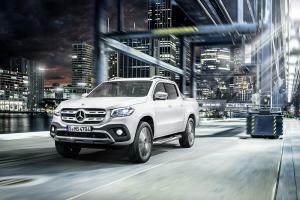 Power, meanwhile, comes with a greater focus on urban lifestyle. Depending on model, some notable features are available, such as a 12v power socket in the load bed, LED load bed lights activated by a dash-mounted switch, and even an electrically-opening rear window. Inside, a variety of different trim finishes are available, ranging from matt black with a pixelated effect, a brushed aluminium finish, or a brown matt woodgrain effect. Man-made leather in black or nut brown covers the top of the dash, with air vents and other highlights in either gloss black or ‘silver shadow’. 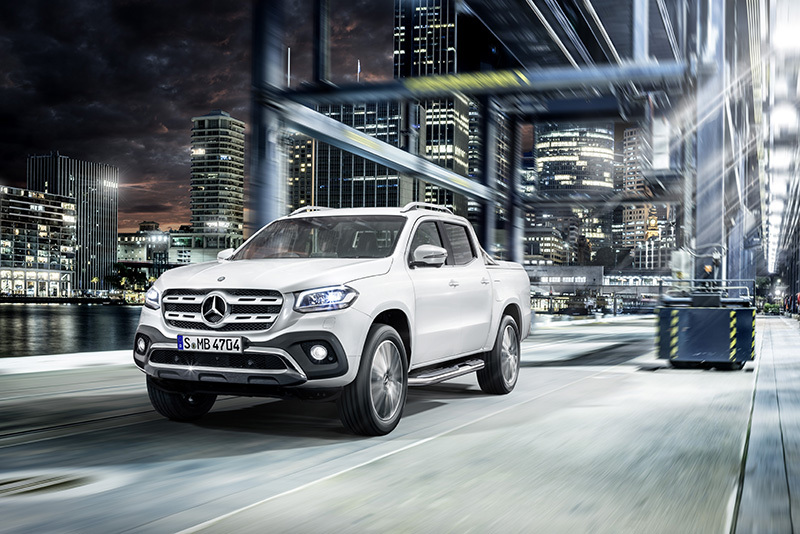 The instrument cluster features a 5.4-inch display between its hooded dials, complementing the dash-top-mounted 8.4-inch COMAND infotainment display, controlled via Mercedes’ multifunction touchpad located near the gear lever. 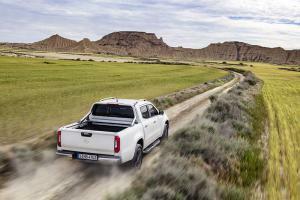 A range of accessories will also be available, from sports bars, tonneau covers, bed dividers, load rails and canopy tops. 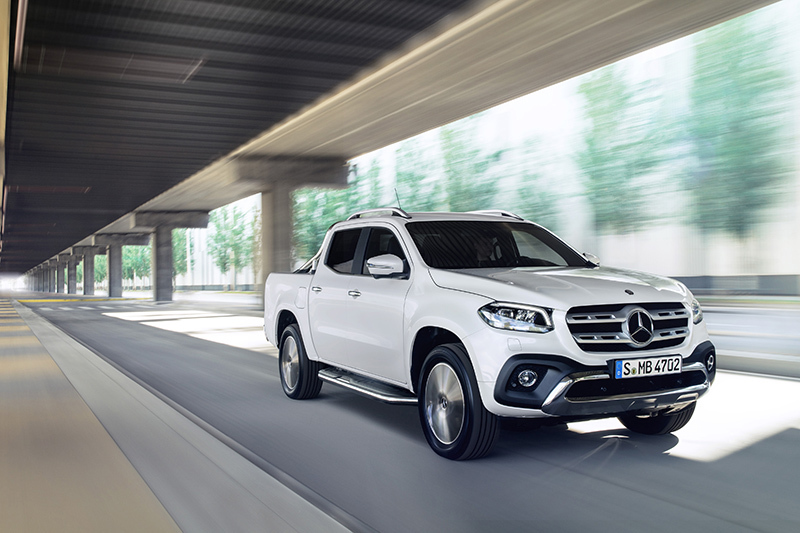 At launch, two four-cylinder 2.3-litre diesel engines will be offered: the single-turbo X 220d produces 163hp, while the biturbo X 250d offers 190hp, both with a choice of rear- or all-wheel-drive. A 165hp petrol X 200 will be available in Dubai and Morocco, but not elsewhere. Transmissions are six-speed manual as standard, while a seven-speed automatic can be specified for the X 250d. Mid-way through 2018, a more powerful V6 diesel with 258hp and 550Nm will be added, badged as the X 350d. 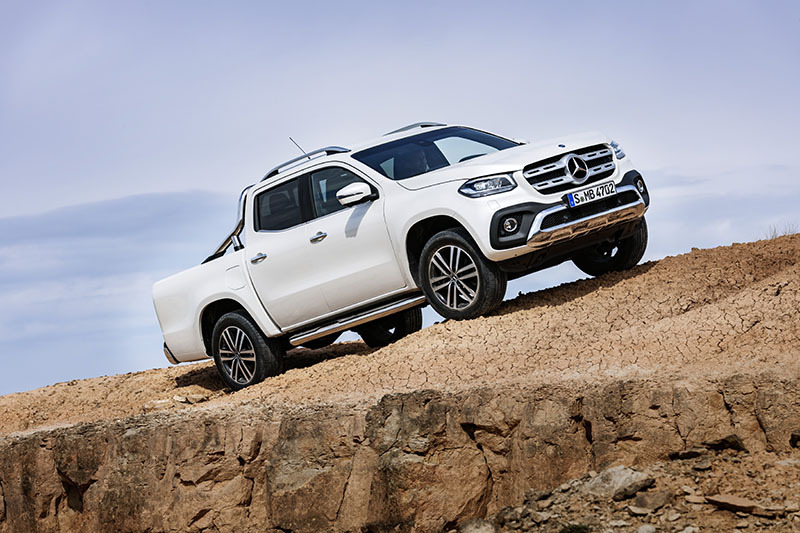 It features a seven-speed auto as standard, plus permanent all-wheel-drive – other models are part-time only – as well as five drive modes – Comfort, Eco, Sport, Manual and Offroad – with each mode modifying the responses of the engine and transmission. Available safety systems include Active Brake Assist, Lane Keeping Assist and Traffic Sign Assist, plus tyre pressure monitoring, trailer stability assist, and emergency SOS response. Also available depending on model will be cruise control, LED headlights with six elements, reversing camera or 360-degree camera. However, questions remain over this new model’s ability to stand up to abuse; the Navara on which the X-Class is based does not have the best reputation for reliability.